Wow. This book was good. I was looking on audible.com for a book to listen to, and saw this title and without reading a description knew I had to read it. Then I read the description and knew this book was perfect. Boston natives T.C (short for Tony Conigliaro) Keller and Augie Hwong are now juniors in high school and one of their assignments was to write about their most excellent year. For them, and one other friend, it is their freshmen year where all of their lives change forever. First Alejandra, the daughter of a Mexican ambassador, moves from Washington D.C to Boston after her father takes a job at Harvard. Second, T.C falls in love with Alejandra, though she hates him (at least she pretends she hates him). Third, Augie discovers he is gay, which T.C knew for years. And fourth, a deaf child brings them all together in ways they never imagined when they try to grant his wish. 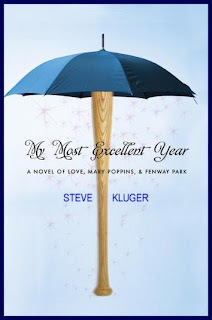 Baseball, love and musical theater make this a good book from the start. But it was cleverly written, switching perspectives and means of communication. A lot of it is written in diary form, some is narrated, other parts are emails or instant messaging and some are homework assignments. Augie and T.C have been best friends since T.C's mother died, they are so close that they call each other brothers. The characters were extremely well created in this novel, I especially liked the connection Augie and T.C had as brothers. I listened to this book on my iPod and I could not have thought of a better way to read it. This book was seriously meant to be read aloud. The actors reading for each of the characters didn't just read the book, they acted it out. For example, T.C has a very heavy Boston accent and the actor read it with one. I highly recommend this book to anyone who likes musical theater, Mary Poppins or the Red Sox.